the Legionnaire of the year award. The 100th Annual American Legion Department of Washington convention, held July 18-20, 2018 in Spokane Valley, brought together members from all over the state. The Department of Washington is the American Legion in the entire state of Washington. Our Post 227 was authorized to have two delegates, so we sent our Commander, Larry Fischer and our Adjutant, Earl Thompson. Larry Fischer has been a tireless advocate for Post 227, even before becoming commander, and is by far our best recruiter. Largely due to his efforts, our Post 227 was one of the few to exceed its membership target for the past year. 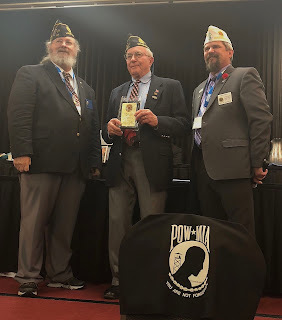 Larry won the Legionnaire of the Year award primarily because of his recruiting efforts and his efforts to increase our interactions with the surrounding community. 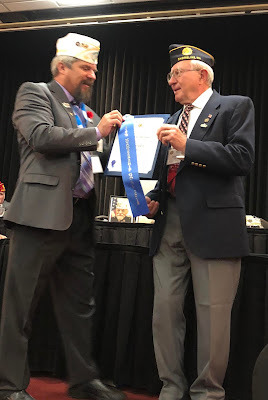 With more than 30,000 Legion members in the State of Washington, it was quite an honor for Larry to be singled out as the Legionnaire of the year. He was nominated by Carrol Stripling, District 11 Commander.